On May 23 at 6 a.m. EDT (1000 UTC), the Moderate Resolution Imaging Spectroradiometer instrument aboard Aqua captured a visible light image of Mekunu. 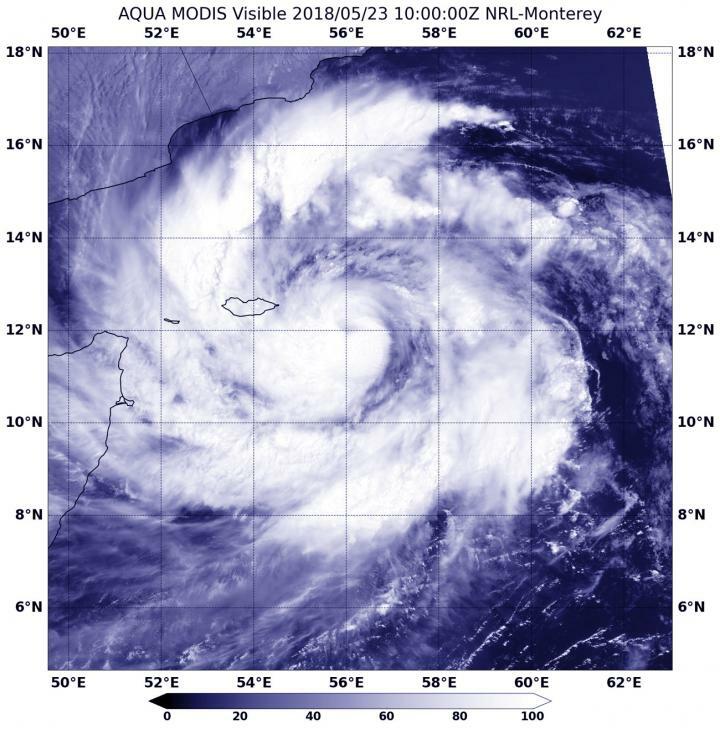 The image showed the low-level center of circulation southeast of Masirah Island, Oman. A band of thunderstorms in the western quadrant stretched over the island and skirted the Oman's mainland coast. Bands of thunderstorms were spiraling into the low-level center as the storm continued to strengthen in the warm waters of the Arabian Sea. Multispectral imagery also showed that Mekunu has developed an eye. At 5 a.m. EDT (0900 UTC) on May 23, Tropical Cyclone Mekunu (formerly 02A) had maximum sustained winds near 69 mph (60 knots/111 kph). It was centered near 11.7 degrees north latitude and 56.1 degrees east longitude, approximately 555 nautical miles south-southeast of Masirah Island. Mekunu has tracked north-northwestward at 4.6 mph (4 knots/7.4 kph). The Joint Typhoon Warning Center noted that sea surface temperatures in the region remain very warm 87.8 to 89.6 Fahrenheit (31 to 32 degrees Celsius) and will allow for additional intensification. Mekunu is tracking north-northwestward along the southwestern edge of the subtropical ridge (elongated area of high pressure) located to the northeast. Mekunu will continue to track north-northwestward through over the next two days. The Joint Typhoon Warning Center predicts that landfall will occur just west of Salalah, Oman on May 26 with winds near 80 knots. The storm is expected to weaken after landfall and continue on a west-northwesterly track.